Set in its own wonderful gardens, the Veronica Hotel combines charm and style to great effect. 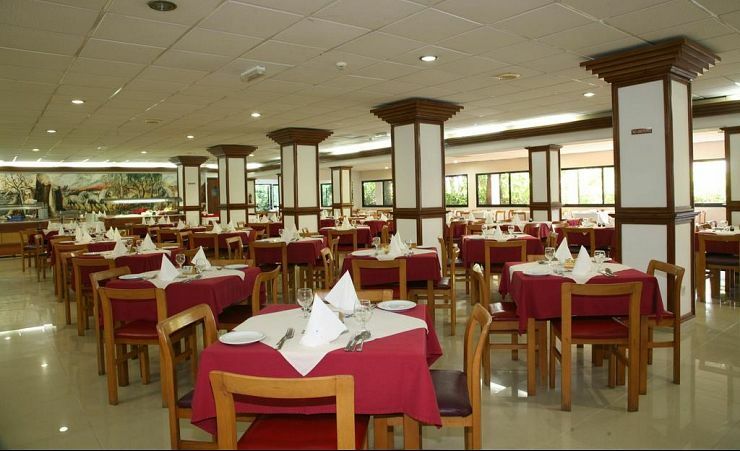 Inside, cool stone tiled floors throughout give it that distinctive Mediterranean feel. 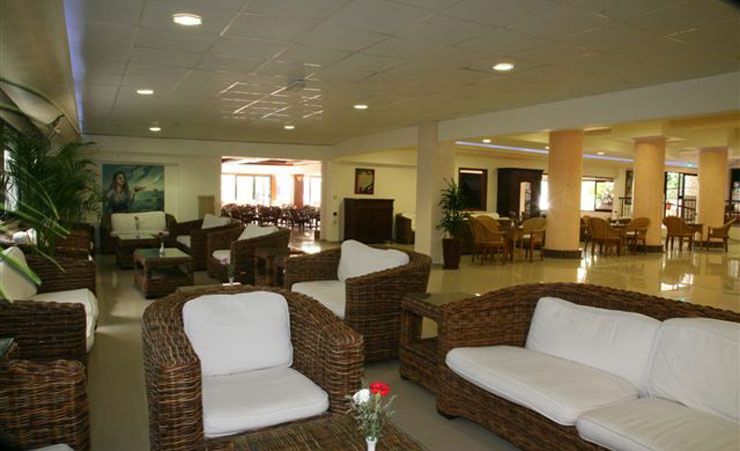 While its soft furnishings and comfortable chairs give it the feeling of a comfortable home away from home too. The outdoor swimming pool is fringed with trees, giving it a Caribbean feel, and offering lots of cool shade to relax in, pre or post swim. We certainly recommend an afternoon dip, a snooze and a little something from the pool-side snack bar or some time in the games room. Then if you fancy a siesta, you'll find your room wonderfully conducive to a pleasant afternoon nap as well as a peaceful night's sleep. The clean, white walls and tiled floors keep that fresh cool vibe going, and make each room a quiet haven away from the holiday hustle and bustle. 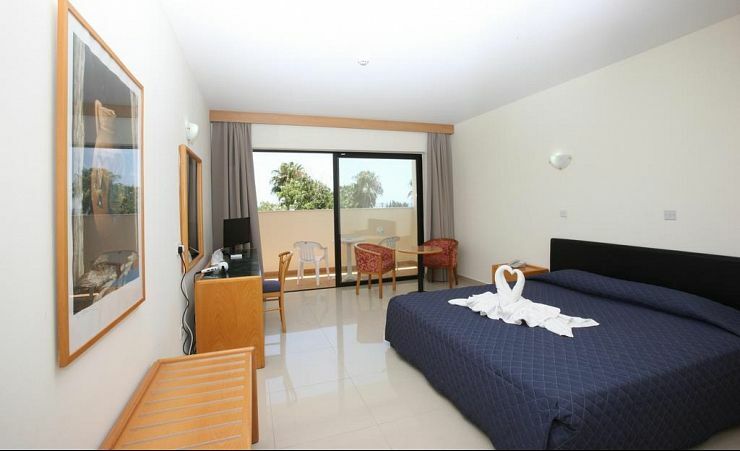 All twin-bedded, en suite rooms are air conditioned and feature a private balcony. And a little part of every day should certainly be spent on the balcony with a cool drink in hand. 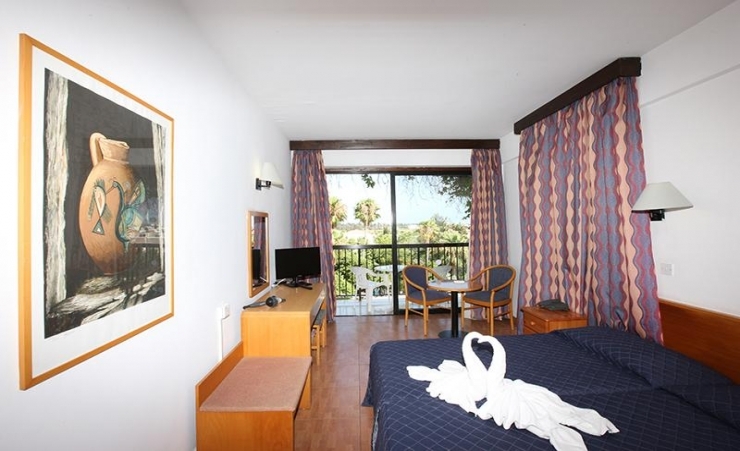 Rooms also feature phone, TV and hairdryer. A mini fridge is available on request. 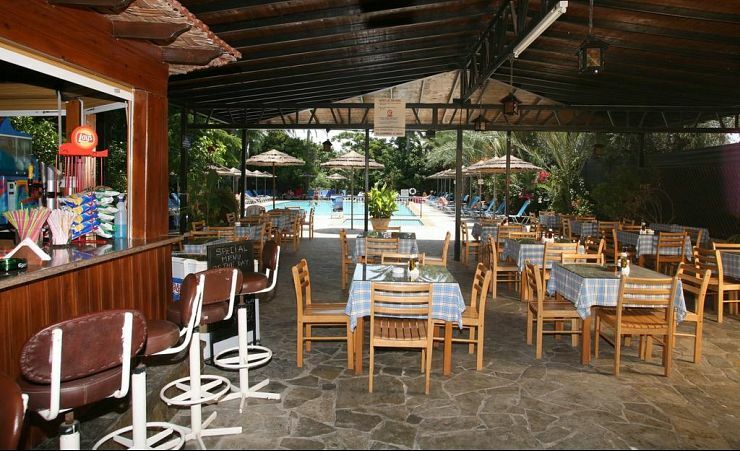 As well as the poolside snack bar, the Veronica Hotel in Paphos features an expansive restaurant. The tall beams and crisp linen reinforce that lovely sophisticated air –while the cosy table settings make for all sorts of possibilities: romantic meals for two or big clusters of friends all enjoying dinner together. Light All Inclusive - On this board option your package would contain Full Board meals, 6 drinks (local alcoholic and non alcoholic) and afternoon tea/coffee and biscuits. Beer will be served as half pint and is local beer. Time and measurements stipulations may apply. 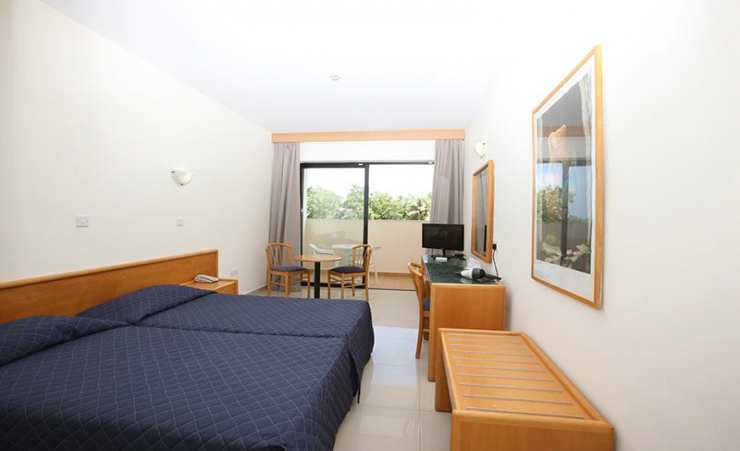 Find out more about your accommodation and the in room facilities at the Veronica Hotel . A great 3* hotel. Friendly helpful staff who enjoyed their jobs. Can't fault this hotel for a 3 * . Management is excellent. The rooms are cleaned daily. The staff are friendly. I find the food very good as it isn't typically English. We will definitely return again. Fiona our rep at the hotel excelled in her duties. Many thanks for a great time at the Veronica Hotel, i had stayed there 10 years ago and they have done a wonderful job in updating the hotel. As for your staff i think they are just wonderful, i have never come across a bad rep from Mercury. Had the good weather too and having a bus pass was just great, thank you once again for a really great service. FAIR BUDGET HOTEL, ALL STAFF VERY FRIENDLY AND HELPFUL. ROOMS GOOD WITH A GOOD BATHROOM. ALL IN ALL A GOOD HOTEL AND WOULD STAY THERE AGAIN. ON ARRIVAL AT PATHOS AIRPORT MET BY MERCURY REP WHO WAS EXCELLENT, TAKEN OUTSIDE AND PUT IN TAXI TO HOTEL. I WAS MOST IMPRESSED AND WOULD RECOMMEND MERCURY TO FRIENDS AND FAMILY. Very good hotel, clean and well run. No evening entertainment. Food was plentiful. Mercury rep Fiona was excellent. Lovely family run hotel. Very clean. Drinks reasonably priced. Good selection of food..could have been hotter. Staff very friendly. Very well managed hotel. The Hotel suited our needs exactly. Simple, Clean and good food. Brilliant friendly welcome on arrival- room was fine , Not swept daily but Ok. variety of food was good - a selection of local dishes throughout the week. Wine and beer on lite all inclusive was good. All waiting staff were very friendly and hard working especially bar person , they made us feel very comfortable and welcome. The Owner and the Hotel Manger were always about and they too were most friendly - and we felt part of the hotel family. 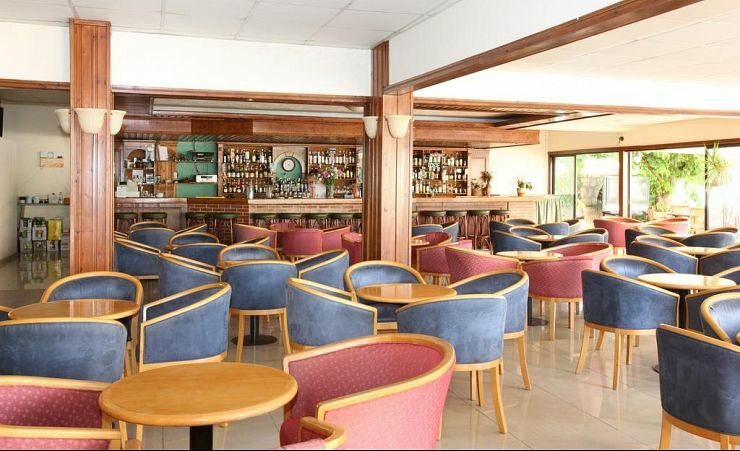 Very pleasant family hotel,all staff friendly and pleased to help. A little away from tourist area and entertainment,but bus stops outside the hotel so getting around very simple. Lovely gardens.plenty of choice re:food. Easy walk to beach and harbour.